Since our company’s founding in 2015, we have made a lot of strides and growth with web design in Utah and across the country. Now, we are taking the next step towards our goal of becoming a top web design and online marketing firm – with thanks to our friends at C. R. England. After six months of design, development, and stress, we finally launched C. R. England’s newest site on February 28th! Celebrating the launch of the site is for good reason. This project wasn’t just a normal website for a normal client – it’s a new marketing tool for a billion dollar company. C. R. England, which is known to many as a trucking company, is in fact, the leading transportation company in North America. They provide many solutions for its clients to ship products with their giant fleet – which includes thousands of trucks and shipping containers. You’ve probably seen C.R. England’s famous crest on their many trucks driving on highways across the country. Even though many people may see their trucks on the road every day, they had one major setback in terms of marketing: a website that represented who they are and what they do from a business perspective. C. R. England’s old website was functional but needed to be updated and brought into the modern age of web design possessing both form and function. 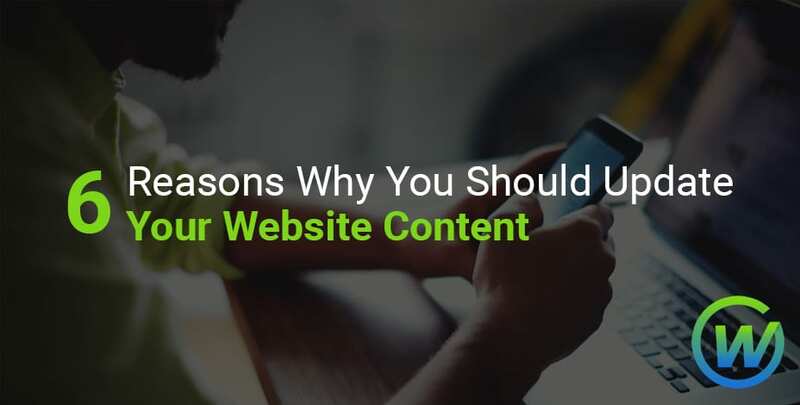 It lacked mobile responsiveness, quality graphics, and the ability to keep potential leads or truck drivers excited about the company. When C. R. England hired us, we had one job: To regenerate the excitement, and to enhance the company’s high reputation and tradition. We did exactly that, we gave it both strong clean form and high-quality functionality. In order to create structure, we took the site design in a new direction. This includes using next-gen graphics, simple icons, and high-quality images and videos. Updated, Modern Design: C. R. England’s main motivation is to transform their website to give everyone a more simple, organized platform to communicate their marketing message. Mobile Responsiveness: One major component C. R. England’s old website was lacking was the ability to become responsive on smartphones and tablets. Mobile websites are essential for modern online marketing, and C. R. England was losing a lot of potential profits due to the old site not having mobile capabilities. The new website is designed to respond to many different screen sizes for customers and truckers who are on the go – which is a key demographic for the trucking company. 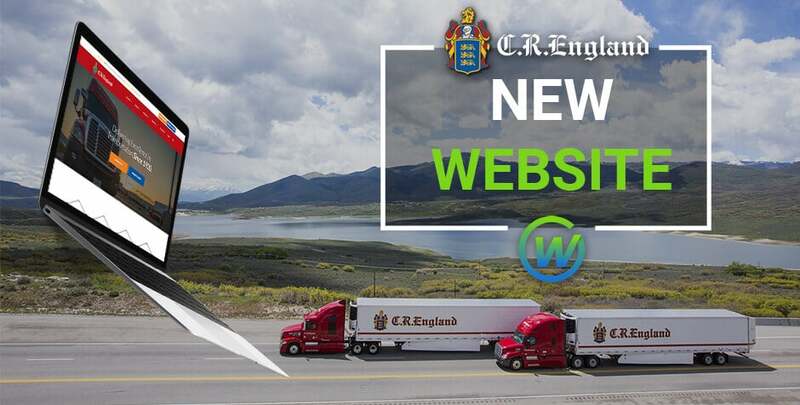 Ready for Truck Drivers: The new website for C. R. England was built to not only to cater to potential and current customers but to their key force for making their business run: Truck drivers. The new website was built with truckers in mind with multiple pages and features that are catered to them. This includes pages for careers, truck driving schools, programs, benefits, and more. 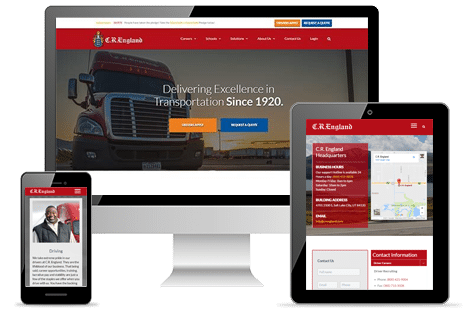 C. R. England’s truck drivers are the main reason why the business is so successful in the transportation industry, so having a website involving their source of business and employment is a must. Keeping Tradition Alive: Being in business since 1920, C. R. England has a long and proud tradition of keeping America on the move. The website illustrates the proud history of the England family from their humble beginnings during the Great Depression to being one of the most successful transportation company in the United States. The Company History page has an interactive timeline on how four generations of the England family transformed their company over the course of almost a century. With the new website, C. R. England now has a visual marketing tool that can be showcased to the world. Likewise, we feel that a project of this magnitude will take us to the next step for our business. 2017 is a big year for us, and this project launch was a perfect kick start to it. If you are interested in our work with C.R. England and would like to learn more, give us a call at (801) 432-0676 or shoot us an email at info@webaholics.co.